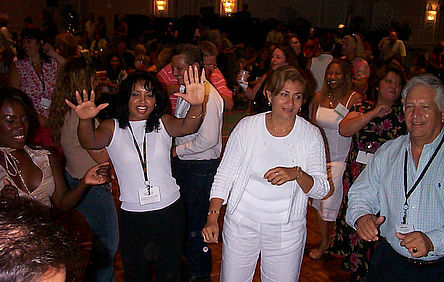 The Best Corporate Entertainment for Your Business! If you’re stuck wondering what to do for your corporate function, look no further than Game Shows Alive. We’re able to create the most magical evening for your staff members using a variety of elements at our disposal. To ensure that everything goes without a hitch, with experienced planning staff on hand, you won’t need to sweat the small details. Our professional team of planners will handle everything right down to the last detail and all within your budget. Don’t burden one of your staff members with the pressure of creating a spectacular event, let all of your staff enjoy the magic and wonder that follows Game Shows Alive events. 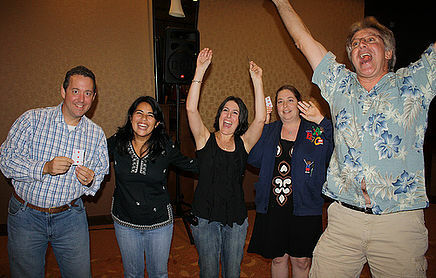 The entertainers at Game Shows Alive are capable and reliable professionals. We have a range of entertainers on hand for all of your entertainment needs. All you need to do is specify what form of entertainment you’d want for your event. Our fun and interactive hosts will keep you in stitches as you watch your staff and colleagues participate in a host of live game shows. At Game Shows Alive we’re able to provide you with a host of interactive entertainment in the form of various game shows that can be specifically tailored to your event or company. With game shows such as “Team Feud”, “All In” and “Jukebox Bingo”, you’re sure to find a winner that will keep your staff entertained for the evening. This is a game show that tests general knowledge and increases competitive levels amongst individuals and teams. It’s the perfect way to liven up a corporate event. With a spinning wheel and a missing letter, your staff members will need to be quick thinkers for this word puzzle game. This is a brand new game show game as it pits 2-4 contestants against one another as they try match as many answers given by members of the audience. It’s an extremely fast paced game that requires the involvement of almost everyone attending you event. If you want any added extras- don’t hesitate to ask our friendly and reliable team and we’ll do our best to make your event desires come true. If you want a specific theme or a variety of decorations, our professional planning staff will ensure that you’re thrilled with the outcome. If you’d like, we can have professional video support on site to record the magical night that is your corporate event. You’ll be provided with all the videos after the event to look at to your heart’s content in order to re-live the magic and wonder. Is your sound a little fuzzy? It definitely won’t be with Game Shows Alive, we know how to throw a party and sound will definitely not be a problem. The reliable and competent team at Game Shows Alive has you covered to create the perfect ambience with our lighting technicians. If you want the bright spot lit stage then you’ll have it. 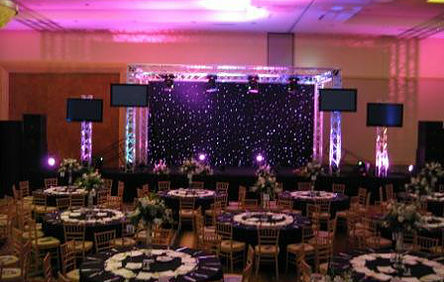 We can create the perfect mood with our lighting techniques to ensure that your corporate event is a memorable one. Party Nation Events, Inc. is the parent company of Game Shows Alive. We’ve been designing entertainment concepts for our corporate clients for the past 30 years. We’ve got it all ranging from musical entertainment to interactive plays. We’ll do everything we can using all the elements at our disposal to create a magical, fun and successful corporate entertainment event just for you. It will be a show to remember that your employees will talk about for years to come! If you’re undecided on what to do for your corporate event, give us a call and we’ll ensure that magic happens at your next corporate event.